An online ad offering everything in the house for free left one landlord with quite a shock: By the time she realized what was going on, the house had been stripped of its light fixtures, hot water heater — even the kitchen sink. Laurie Raye said she traced the damage to a fake ad on craigslist, a San Francisco-based Internet site for classifieds. "The instigator who published this ad invited the public to come in and vandalize me," Raye told Seattle television station KING. She said the rental home wasn't occupied at the time because she had recently evicted a tenant, but it had other items inside. Even the front door and a vinyl window were pilfered, Raye said. "In the ad, it said come and take what you want. Everything is free," she said. "Please help yourself to anything on the property." Raye said she contacted craigslist and received an e-mail saying officials would need a subpoena or search warrant to release information about who posted the ad. The online hoax isn't unusual, investigators said. "We've had a lot of scams," Tacoma police Detective Gretchen Ellis said. "We've had prostitution things happen, rental scams, fraudulent activity. In this case, it appeared the items were going to be given away, but they were not." 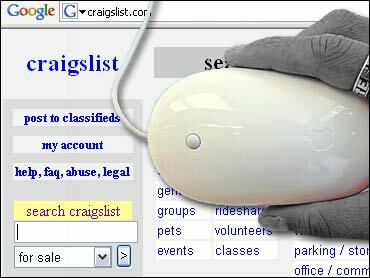 Craigslist officials did not immediately respond Thursday to a request for comment by The Associated Press.